Contents 1. KEY INFORMANT SURVEY 1.1 Purpose 1.2 Overview of Key Informant Survey 1.3 Background of the Key Informant Survey 2. FINDINGS & RECOMMENDATIONS 2.1 Develop an expanded public outreach program. 2.2 Develop an Operation Landscaper Plan as well as an End-Use Plan. 2.3 Implement a Pilot Projects Program to monitor and assess the closure systems and cover vegetation. 2.4 A Conceptual Wetlands Management Plan should be developed with extensive review and input from the community and regulatory agencies. 2.5 Negotiations with DPR should be expanded and focus on actions which could be taken now as well as upon the phased closure of sections of the landfill. 2.6 Develop programs to better address local concerns about odor and litter. At the outset of this project, several major issues were identified during the Key Informant Survey as unresolved which would have a significant impact on the conceptual design for the landfill. Concurrently, those interviewed frequently raised issues which go beyond the planning team's scope of work, but which ultimately may impact the success of this project, and so are also included here. Community relations concerning the landfill are understandably strained. The landfill has been the subject of controversy since its inception and there is strong local resentment at being saddled with the whole region's trash. The landfill is a major presence, intermittently visible from half of Staten Island and growing more so daily. Odor is a persistent problem over a larger area and constitutes the community's most vocal complaint. There is also widespread concern about water quality. There is a high degree of public mistrust and virtually all actions taken by DOS are automatically suspect. The most consistent request made by those interviewed was for DOS to provide more information on topics ranging from current DOS planning goals and waste management policies to Fresh Kills itself, including the closure schedule and other facilities proposed for the site. At the same time, the opportunity for a greater level of input in the planning process is sought as well as an ongoing structure for communication and participation between the community and DOS. Kills without a permit until 1998, as long as it is in compliance with the terms of the agreement. The Fresh Kills Landfill today is the major solid-waste facility of the City of New York and is expected to remain active for at least another decade. The actual closure schedule is unknown at this time, and will be impacted by fluctuations in trash volume, the sequence of filling, the extent of recycling and composting, and negotiations with federal, state, and local agencies. When the landfill was sited in 1947, the land was known as Fresh Kills Park and was owned by the City of New York Department of Parks and Recreation (DPR). It is widely assumed that the site will ultimately be returned to DPR, although no formal agreement has been located. The program for previous end-use plans, including the one completed in 1984 (Preliminary Planting & End-Use Plan, Wehr an Engineering, April 1984) have included proposed park uses, such as active and passive recreation on and adjacent to the landfill mounds, which would be established upon landfill closure. Increasingly, however, DOS, OrR, and the community recognize that such proposals should be revised to reflect a more realistic closure scenario. The actual landfill closure will occur in sections which could entail a phased transfer to OrR. Other areas will be required for landfill-support facilities, such as gas and leachate monitoring and collection, and maintenance facilities for repair of the closure system, and are likely to be retained by DOS long after closure and at least for the 30-year regulatory review period required by DEC. Proposed plans should facilitate a phased approach and minimize potential conflicts between parkland uses and landfill operations. The major issues raised by the Key Informant Survey have been reviewed by DOS and the planning team during the Inventory and Conceptual Design Phases for the closure plan which were initiated concurrently. Every effort has been made to incorporate these concerns insofar as possible in the planning process. This section of the report seeks to describe those concerns where there appears to be consensus as well as those issues which are unresolved and require further assessment or information. The recommendations which follow represent an effort to consolidate the most frequently reiterated perceptions and to describe an effective project response to the information gathered. In many cases, the purpose of a recommendation is to support or urge expansion of directions or actions which are already underway. Develop an expanded public outreach program. Develop an Operational Landscape Plan as well as an End-Use Landscape Plan. Implement a Pilot Projects Program to monitor and assess the closure systems and cover vegetation. the most cost-effective manner, and addressing scenic and habitat concerns as well. At present, these goals are in conflict. DEC favors herbaceous plant species only, in an effort to ensure the integrity of the cap. This restriction, however, when effected over 100 or 1,000 acres of closed landfill, presents a bleak view to the community and is of very limited value as habitat. In order to assess both existing and proposed cap and cover systems scenarios and to foster the development of innovative alternative landscape solutions which address both design and engineering goals, a program of Pilot Projects is proposed. Virtually all those interviewed favored as natural a landscape character as feasible, with woodlands interspersed with tall-grass and wildflower meadows. These landscape types would also provide greater long-term successional stability than grasses and legumes, the conventional final cover type, and will likely require significantly less maintenance over time. However, this approach cannot be implemented until more cost-effective establishment techniques are developed and questions concerning protection of the cap's integrity are adequately addressed. Therefore, the initial pilot projects to be implemented in 1990 focus on meeting the DEC criteria to provide stable cover. In addition, a variety of cover types on slopes of varying length and steepness will be assessed for stability. Later efforts will address developing alternatives which have greater value for scenic and habitat improvement while meeting DEC eqUivalency requirements. A Conceptual Wetlands Management Plan should be developed with extensive review and input from the community and regulatory agencies. Expanded negotiations with DPR and focus on actions which could be taken now as well as upon the phased closure of sections of the landfill. phased transfer of all or part of the landfill is more realistic. 2. Areas of the site which are proposed for eventual park use which are not associated with current or proposed landfill operations should be reviewed by DPR to assess the short-term opportunities for the development of recreational facilities. 3. The end-use plan should effect the maximum level of separation feasible between landfill infrastructure facilities and areas proposed for a park to minimize potential conflict between these land uses. It is probable that landfill-related activities will persist on portions of the site for decades to come, such as gas and leachate monitoring and management facilities. 4. Generic criteria for proposed landfill transfer should be developed in addition to reviewing the options for Fresh Kills. Because of the likelihood that DPR will eventually be designated as the eventual land manager for many closed landfill sites, it is appropriate that they be involved in the site as early as possible. Liability and safety responsibilities must be clarified as well as monitoring, maintenance, and repair of landfill-related facilities. All transfers must be acceptable to the community and DPR as well as to DOS. All sites proposed for transfer should have stable covers with largely native plant communities as well as complete infrastructure with no nuisance problems. 5. An interagency task force should be established to advise DPR & DOS on possible transfer options for landfill property to park uses. 6. The involvement between DOS and the Greenbelt should be endorsed, expanded, and funded. Currently, cooperative efforts are directed toward assessing native species for establishment of low-maintenance plant communities both on the landfill and in disturbed areas of the Greenbelt. Develop programs to better address local concerns about odor and litter. There are several areas of concern which go well beyond present planning team's scope of work, but which are highlighted here for further study, including odor and litter. Landfill odor, which is expected to worsen as the landfill increases in size, was the most frequently cited complaint. The community, furthermore, is not aware of any serious actions being taken by DOS to address the problem, except that recent experiments with landfill deodorant products were not successful. The possible impacts of the proposed active gas-collection system which will likely effect a significant reduction in odor levels are poorly understood by the community and no quantitative data is available. As a consequence, the general perception is that DOS is insensitive to this highpriority community concern. Without more effective odor control, community opposition will remain strong regardless of other improvements that may be implemented. The development of a comprehensive program to evaluate and control landfill-generated odors should be given a very high priority and include public participation. 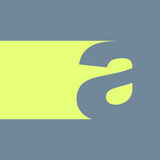 An analogous concern is litter, which also will be effected by actions taken under the current project scope. A comprehensive program to assess and manage litter should be developed with public input. Litter levels also should be substantially reduced by revisions in operations currently under consideration. Shoreline litter has been a problem as well. DEC and DOS are currently negotiating revisions to current practices to remove f10atables and litter from shoreline areas. Once litter is more effectively managed without scraping the vegetation, these tidal marshes should be restored. DOS to ensure equivalent site stability. DEC also expressed general concern about overall slope length and slope stability. Recent topographic mapping, however, shows that the actual slope achieved by recent landfilling operations rarely exceed 3:1.
transfer of ownership of Isle of Meadows was raised as well as a suggestion that for management agreements with the New York Audubon Society and the Manomet Bird Observatory could be effected virtually immediately. There is concern that proposed potential park uses are often inflated and unrealistic, such as Pelham Bay, which was recently transferred to the National Park Service, which was once promised to be developed as a major ski facility. It was noted that recreational facilities are frequently promised in landfill plans but have rarely been implemented or sustained on former landfills. OPR questioned whether the active landfill areas at Fresh Kills were appropriate for any active recreation, because of problems associated with settlement, which might expose visitors to hazardous conditions and entail unacceptably high levels of maintenance. They asked if a stability study would be available. There is at present no budget allocated by DPR for the development of the Fresh Kills site as a park. OPR inquired what budget DOS has allocated for the development of the Conceptual End-Use Master Plan. With regard to the End-Use Plan, it was generally agreed that the site should be restored to as natural a habitat as is feasible and that every effort should be made to integrate the site with, and extend, the natural systems of the Staten Island Greenbelt. Native plant communities, including forests and shrublands as well as grasslands, should be established on the site and given as little maintenance as is consistent with maintaining site stability and habitat diversity. Tom Paolo summarized the Greenbelt end-use goals with regard to Fresh Kills as including the restoration of the Richmond Creek corridor as a natural area with water-related recreation, such as boating, native habitats established as cover, and some active recreation on the landfill's perimeter. Trails for hiking, bird-watching, and other natural area recreation is considered appropriate as long as safety can be assured for the visitors. The interview process for the Community Boards consisted of an initial planning meeting to establish a Fresh Kills Task Force for Community Board involvement and schedule two work sessions with the design team. The Task Force individuals were responsible for reporting back to their boards on the project's progress. The first work session of the Task Force also included Thomas Paolo, the Greenbelt Administrator, and representatives from the Greenbelt Master Plan Design Team: Joanna Jackson of Jackson & Kihn and Michael Nairn of South Street Design. While this initial phase to develop the program for the closure, landscape design, and end-use plans did not include a presentation to the Community Boards, it was recommended by the Boards that the Conceptual Plan eventually be presented to the full membership. The continuous presence and sight of the landfill in northwest Staten Island is considered a daily burden by the adjacent population. The group repeatedly urged the planning team to "look at the landfill as if they lived there ... just go down Arden Avenue." They stated unequivocably that the scenic impacts of the landfill should be addressed now and during the operational life of the landfill, rather than at some unspecified time in the future when the site or portions of it might become parkland. The community sees the visual intrusion of the landfill as a growing threat which should be addressed now, not an issue to be reconciled by the End-Use Plan. heightened at this time as the area may have been somewhat less impacted. The large DOS trash booms in Fresh Kills Creek appear to have partially contained the oil brought in for many days on each tide, reducing the amount of oil penetrating the upper reaches of the Fresh Kills and Richmond Creek systems. Wetland concerns were given the highest priority by the environmentalists interviewed. Additional information on the remaining wetlands was requested, including historic wetlands extent and current delineations. The groups are also very concerned about leachate impact on the wetlands and requested additional information on DOS's current RFP for Leachate Management. The protection and restoration of tidal wetland fringe and the creation of habitat corridors along Richmond and Main creeks are given very high priority. Additional concern was expressed about the large volumes of sediment trash and uncontrolled runoff which seem to be entering the wetlands from the slopes of the landfill, such as the north face of Section 3/4. A review of appropriate erosion and sediment control procedures with operations was requested as well as comprehensive stormwater management. Upland habitat concerns focused largely on improving air quality through reforestation. The Greenbelt Stewardship Council, for example, requested that the trash mounds be reforested to the maximum extent feasible while retaining an appropriate amount of grassland habitat as well. Their long-term goals for the End-Use Plan are centered largely on hiking, enjoying nature in a recovering landscape and, hopefully, an interpretive center which addresses the dilemma of trash versus nature. acknowledged that failure to develop realistic solutions to the trash problem will probably force a reliance on resource recovery incinerators and disposal facilities which some of the community groups have opposed and others support. They inquired directly about the status of the designated incinerator facility on Staten island and what sites, if any, are under consideration. They wish to help develop a comprehensive Solid Management Plan for New York, instead of simply reacting to DOS's proposals and actions. Concern was expressed over the current situation between DOS and DEC and it was hoped that a more constructive relationship could be established. They also recognize that there are a wide array of different opinions and that crafting a workable consensus will require effective communication and open negotiation. They noted the sense of mistrust the community still has for DOS, reflected in the fact that when the berms were constructed, their first reaction was to assume that DOS was trying to hide something from them. Only later did they appreciate the screening of the landfill. The community groups requested a schedule for their review of the Preliminary Conceptual Plan and Report. address citizens complaints and concerns about the omnipresent, obscene, and unhealthful garbage odor over large portions of Staten Island that emanates from the Fresh Kills Landfill." 2. Clean Water -- " Wetlands -- more adequately protect and preserve Staten Island's fresh water and tidal wetlands . . . . Find an environmentally sound method for dredge soil disposal." 3. Sewage and Solid Wastes -- "Incinerator Ash -- oppose dumping of any New York City incinerator ash at the Fresh Kills Landfill including any plan to mine the old garbage in the landfill in order to build the proposed specially lined ash dump site. 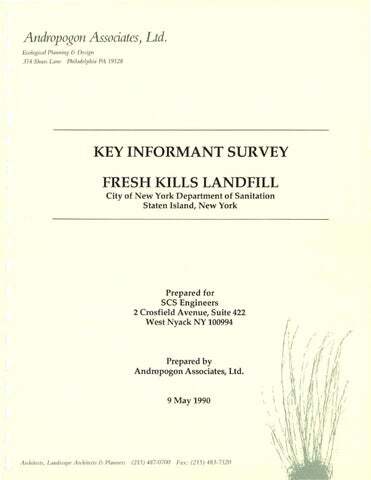 Fresh Kills Landfill -- demand that the Fresh Kills Landfill come into compliance with state and federal laws. Accept no less!" A similar document was also prepared for New York City and sponsored by a wide array of local environmental groups entitled "Environment '89 - A Program for the Future of New York City", which included the following recommendations: 1. "The City must protect and expand its parks, gardens, and open spaces. acquire for the Parks Department privately owned natural sites in city and any city-owned natural sites not in Parks Department. create a continuously accessible, public waterfront. build esplanades and greenways that link major park systems. plant trees and maintain existing ones to reduce carbon dioxide levels as part of global relief efforts to lessen greenhouse effect. recycle everything physically possible (60% - 85%) by 2005 ... and then dispose of whatever residue remains in the most environmentally benign way. Enforce laws, like Federal Clean Water and Coastal Zone Management acts to preserve and protect river, wetland, waterfront, and coastal waters for public open space and water dependent uses. Beil, E. 1983. A Brief History of Staten Island City Parks [from] PROCEEDINGS of the Staten Island Institute of Arts and Sciences, First International Conference on Olmsted Parks, September 1983. Cavallaro, A.D. 1989. Draft thesis for the Pratt Institute: Visual Analysis of the Final Grading Plan for the Fresh Kills Landfill. New York, NY. EcolSciences, Inc. 2 March 1990. Recommended Wetlands Remediation and Protection Activities Report. Environment '89 - A Platform for Staten Island. Environment '89 - A Program for the Future of New York City. LeVeque, T.Ryan. 1988. Nacy Holt's 'Sky Mound': Adaptive Technology Creates Celestial Perspectives, Landscape Architecture. Lynch, RT. 1988. Potential End-Use Plan for FreshKills Landfill, New York City Department of Parks, manuscript. New York City Staten Island Community Board #1. 1989. Fiscal Year 1990 Capital Budget Priorities & Requests. New York City Staten Island Community Board #3. 1989. Fiscal Year 1990 Capital Budget Priorities & Requests. New York State Department of Environmental Conservation. 1990. Memorandum: Stormwater management Guidelines for New Development (Originator: Philip M. DeGaetano). Division of Water Technical & Operations Guidance Series (5.1.8). New York State, Office of Parks, Recreation, and Historic Preservation. People, Resources Recreation - New York Statewide Comprehensive Outdoor Recreation Plan. 1988-93. O'Leary, P.R, P.W. Walsh, and RK. Ham. 1988. Managing Solid Waste [In] Scientific American, December 1988, Vol. 259, No.6, pp. 36-42. Trust for Public Lands. 1990. The Harbor Heron's Project. Wallace, McHarg, Roberts and Todd. 1968. The Least Social Cost Corridor for Richmond Parkway. A study commissioned by the New York City Department of Parks. Philadelphia, PA, May, 1968. Wehran Engineering. April 1984. Preliminary Planting and End-Use Plan, Sheets 27 & 28 of DOS, Solid Waste Disposal, Fresh Kills Landfill Operations Plan. Wehran Engineering. April 1984. Final Grading Plan, Sheets 3-6,14,16 & 19 of DOS, Solid Waste Disposal, Fresh Kills Landfill Operations Plan.